It’s been a while friends, but I’m back with some serious good stuff. Thank for all the messages for my birthday, I really felt loved last weekend. I had a splendid time, but I’ll talk about that another time. Tomorrow is Friday, and I cannot wait since it’s a free day for me! Enough chitchat, after the jump you’ll find this month’s links to some magical places of the Internet. 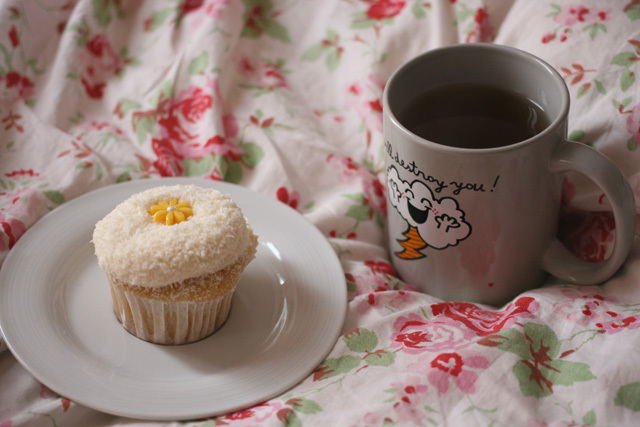 – Also, yes, that is a lemon coconut cupcake. A little while ago I came across a blog called the Worship Blues. A very personal and genuine blog by a couple named Yasumi and Hiro. “We travel, we learn, we listen and we feel our way around the world looking for soulful moments to enjoy and remember.” is on there about page, which I think is pretty much already a reason to follow their blog. But then I stumbled upon this post, which I loved especially. In which Yasumi shows off this supercute skirt she made with this pattern from deer & doe. And I’m sold…now I don’t sow a lot, but I might actually check out the local fabric shop again soon. Now I’ve been swooning over Ilflor for a very, very long time. But I’ve almost as equally long been swooning over this pair they still have on their website. Moca is a mocassino made of white leather and has a white and gold sole. 250 bucks, or now 175, is a bit much for me as I’m dealing with a student budget. But aren’t they a dream? HelloGiggles is one of my favourite “big” websites. In the sense of different authors and random content. It’s often related to being a 20-something-trying-to-have-a-life. And then there’s “Slang Terms that need to come back, by decade“. Need I say more? One thing that I sometimes really need is some perspective. To be able to put things into perspective and to not be too wrapped up with the things I get too wrapped up in, that don’t even matter that much! So here’s a little post on tumblr I really liked. This post by Heidi Swanson made me get the idea of having a picknick with my family on my birthday (yes, that happened). I think I spend way, WAY too little time with my family nowadays…meaning the whole of my family and not just my parents. I think putting time and effort into the relationship with you siblings is absolutely worth it. So, uh, yeah… family-birthday-picknick! But really, just look at the recipes! I think I’m getting back into pop music nowadays. With Sia’s new album being pop-y and now this song by Colbie Caillat you’ve probably already heard about. I like it that pop music gets a little, just a tiny bit, more serious these days. Or, well……..sometimes. It’s not that I especially like the song from Colbie Caillat, as you probably know by now I’m more of an indie-kind-of-girl. But I really like the idea and the effort. Talking about popular music, you all know Lorde’s song called ‘Royals’, right? Well, have you seen this farmer serenade ‘Royals’ on his trombone to his cattle? Yeah, well, just look at that.It’s cute and strange at the same time.